This article is not about the administrative district Akihabara in the Taito ward. 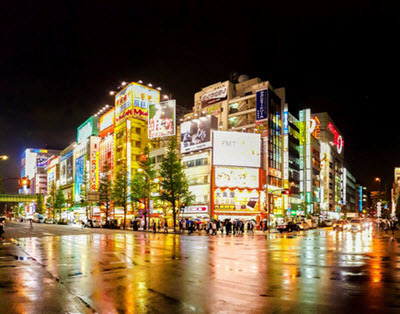 The busy commercial district around the Akihabara Station in Chiyoda is commonly referred to as Akihabara or simply Akiba. Administratively, the Akihabara it falls partly within the district Sotokanda and partly within Kanda-Sakumacho. 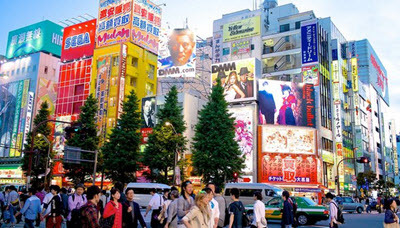 Soon after the end of World War II, a black market for electronic consumer goods developed here, known as Akihabara Denki Gai which means Akihabara Electric Town. Today, the area is also famous as a cultural focal point for otaku, and thousands of people – both Japanese and foreigners – come here to shop for anime, manga, video games, cosplay goods, etc. People in fancy dress-up costumes are a common sight in the streets and within the stores, and Akihabara is home to numerous maid cafés and other cosplay esablishments. The main shopping street of the commercial district Akihabara is located just west of Akihabara Station. This is a where a majority of the shops selling household electronic goods are located, and this is where the post-WWII black market developed. Just to the north is the area famous for anime, manga, cosplay and other things considered otaku. Walking through the otaku parts of Akihabara can be somewhat of an otherworldly experience, as so many of the establishments, and quite a few of the patrons, are doing their best to create an otaku atmosphere. Otaku is a Japanese term for people with obsessive interest, but since the 1980s it’s been chiefly used for people with an interest in anime, manga and related subjects. It’s modern use originated in Akio Nakamori’s essay “Mango Burikko”, published in 1983. The term otaku can be used derogatory, but there are many people and Japan and worldwide who self-identify as otaku. Akihabara isn’t just a place where you can buy otaku products and meet fellow fans; it is also the site for a very large amount of release events, conventions and other special events related to otaku. This is for instance a great place to look for events where you can get a chance to meet anime and manga creators. As early as the 1970s, publishers released new manga creations in Akihabara to test the market and see if the products should be made available on a grander scale. Today, many of the buildings in the otaku-parts of Akihbara are specifically design to match popular otaku themes. Many establishments are not see-through in the front, creating a private atmosphere within where visitors can engage in their otaku interests without feeling as if they are on display to the outer world. A lot of small-scale amateur producers of otaku items sell their products in Akihabara, which makes this a great place to purchase rare and unusual products that you wouldn’t find on the shelves anywhere else. It is for instance possible to get your hands on a lot of dounjinshi here – fanmade manga based on manga, anime or video games. The idol group AKB48 is named after Akihabara (Akiba) and has its own theatre in this area. The group is comprised of well over 130 girls and women, aged from early teens to mid-20s. As of June 2018, the group has sold over 56 million records, of which slightly more than 6 million were albums. In terms of singles sold, they are the highest selling musical act in Japan.